Joining Washington State, Oregon is also considering a road usage tax on electric car owners, according to a report published Wednesday by the Statesman Journal. However, where Washington State is imposing a flat fee per year on electric car owners, the proposal being considered in Oregon is a per-mile tax. To reiterate, the highways cost money to build and maintain. Traditionally, in the U.S., that money comes from the "Gasoline Tax" paid at the pump by drivers. It is a transparent way to anonymously collect money in amounts directly related to the usage of each vehicle. It's probably a bad choices of phrases to call this a "Gasoline Tax" because the purpose is to cause drivers to pay road usage fees. Countries and states around the world have had a variety of methods for collecting road usage fees, with some countries collecting per-vehicle taxes rather than a tax at the gasoline pump. Taxes collected at the gasoline pump are fair and anonymous, but only so long as vehicles are fueled at gasoline pumps. Of course, that is not where electric cars are fueled, and therefore electric car owners currently are getting away with using the roads without paying any kind of road use fee or tax. The Revenue committee in the Oregon Legislature is slated to consider a bill in 2013 to change this tax system for collecting gasoline and road usage taxes. Oregon has long been a leading state in adopting fuel efficient vehicles, including electric vehicles. In 2001 the Legislature formed a Road User Fee Task Force chartered with finding a revenue system to offset a drop in gasoline tax revenue from those fuel efficient vehicles. According to the Statesman Journal report, Oregon has had at least two pilot projects to test road user fee collection on a per-mile basis. In the latest pilot, 50 participants were paying a couple cents per mile and received a credit for any gas taxes paid at the fuel pump. They reported miles driven either with a smart phone application or a GPS device. Participants could also pay a flat fee. The variety of choices available was meant to get insight into which plan would be more attractive to electric car owners. Among the concerns is whether to track miles driven on private roads, or miles driven outside Oregon, or for the State Government to have a precise record of every trip taken by every driver. That is, the governments who operate the road system do need to collect user fees, but what is the fairest method of doing so, that doesn't raise big-brother concerns along the way. Electric vehicle advocates are opposed to imposing these taxes at this time. Because the number of electric vehicles in operation is currently small, the revenue collected may not be enough to even pay for the system that collects the revenue, much less make any contribution to the transportation fund. It also sends a mixed signal to the marketplace, because on the one hand governments are offering tax incentives to buy electric cars, and on the other hand are looking at imposing special taxes on electric car owners. However, that may be a testament to how transparent the gasoline tax system is, that gasoline car owners tend to not notice they're paying a tax with every refill. 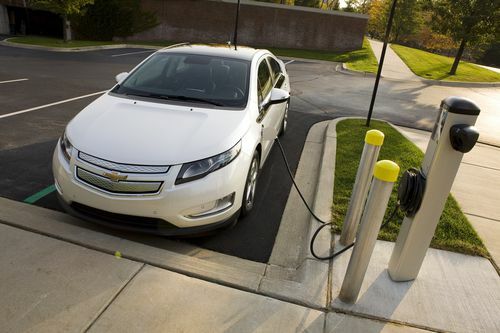 Eventually electric vehicle owners will have to pay their fair share of road usage fees. The questions are, when, how much, and how it will be collected. I like the flat fee at $100. Strange that the plug-in hybrids are exempt, especially the Volt. I wonder which legislature spends the most time with the Chevy lobbyist. As a driver of an ActiveE I would prefer to pay a flat road tax once a year. Happy to do so too. I don't want to have to worry about tracking miles driven and I don't want some kind of embedded GPS system in the car for this purpose. How about I pay it when I pay my yearly car registration fee? Seems simple and easy to me. $100 is an extreme bargain compared to what most of us pay in state and federal gasoline/diesel taxes. I've always wondered, though, why the road use tax isn't attached to tires. They're what actually connect with the road and every vehicle uses them. Seems obvious to me and it would be equal across the board, regardless of power train. How about building a cellular based system into home chargers that could charge a per kilowatt based tax in the same way a per gallon gas tax is collected, and then the recipient could receive a monthly or yearly bill on this usage. And for standalone commerical or public chargers the fee could be collected simply by increasing the per kilowatt fee just as is done at the gas pump. Why are none of the legislators proposing this bill named??? And, why is it not mentioned that electric car owners would be "fueling up" from the electric grid, which is already taxed! So the revenue generated from fueling up at the pump would not be lost, only transferred to the electric grid tax. I am not an anti-government, anti-tax nut but it looks like legislators have not accounted for the electricity tax that would kick in for electric car owners or are trying to pull a fast one on Oregon tax payers. I agree. This needs to be well thought out before jumping of the tax cliff.